If you're going to become fitter, you have to train for it, and that's where the aptly named Training menu comes in. The Training menu, shown in Figure 1-6, includes Training Plus, Yoga, Strength Training, Aerobics, Balance Games, and My Wii Fit Plus options. It is also where your Fit Bank resides, which we describe in greater detail a little later on. Notice the virtual Balance Board in the background trying to get your attention? You can click on it to go to the Ultimate Balance Test or Scale Challenge, which are described in Chapter 2. From the Training menu, click any of the options on the right-hand side to bring up the applicable training submenu. For information on Yoga and Strength Training, refer to Chapter 3; My Wii Fit Plus, Chapter 4; Aerobics, Chapter 5; and Training Plus and Balance Games, Chapter 6. ✓ Hover over an icon in a Training submenu to see the name of the exercise and how many times it's been attempted with your Mii. 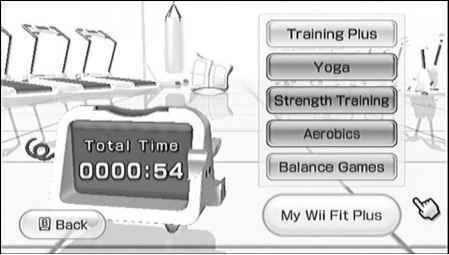 Unlike the original Wii Fit, all exercises are available to you from the outset, except for the three Strength Training Challenges, which are grayed out and will have to be unlocked. The initial Training menu screen. ✓ Click the + and - buttons at the top of the screen or press the same buttons on the Wii Remote in a Training submenu to go directly to the other training submenus. ✓ Click the Back button in the lower-left corner of a Training submenu or press the B button on your Wii Remote to go back to the Training menu. ✓ Click the Switch Trainer icon to toggle between the male and female trainer in the Yoga and Strength submenu. ✓ In the Yoga and Strength Training submenu, after you select an exercise, you can click Demo to watch a trainer explain how to do the chosen movement. Click the Skip button at any time to jump to a screen that allows you to get a more detailed view of the trainer performing the exercise. From this screen, you can rotate your viewpoint around the trainer by pressing A and moving the Wii Remote pointer around the screen. The 1 and 2 buttons on the Wii Remote allow you to zoom in and out, respectively. Click the Pause button on the screen to stop a trainer's movement and study its position, or click Restart to have the demonstration begin again. After you are ready to begin the activity, click the Start Workout button on the lower right of the screen. When you're performing an exercise, press up or down on the directional pad on your Wii Remote to change the camera angle focused on the trainer between front and rear to personalize your view. ✓ Switch between players by clicking the Switch! button on the bottom right of the screen in the Training Plus, Aerobics, and Balance Games submenus. You can select from any of the players on your system, including unregistered users, but these players won't build up Fit Credits, which we discuss shortly. At any time during training, you can click the + button on your Wii Remote to bring up the Pause menu, which will give you the option to Continue, Retry, or Quit. Continue resumes the current activity, Retry restarts the current activity, and Quit brings you back to the Training menu. 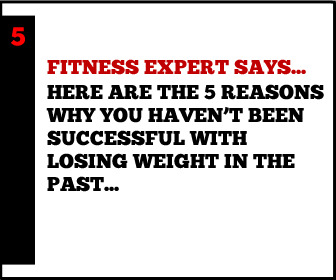 Keep in mind that if you Quit, you won't get any Fit Credits for the current activity. So, let's go over those Fit Credits. Anyone who wants to experience better health and fitness... Discover Simple Techniques To Getting Fitter amp Healthier And Staying That Way, Starting Today! 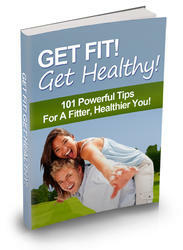 This Guide Will Show You Easy Ways To Get Fit And Get Healthy No Fluff, No Fillers...Just Useful Techniques You Can Start Using Today.